Maid2Clean domestic cleaners are professional, hardworking and will leave your home clean and tidy so you can spend your time doing what you want to do. If you’ve never used a domestic cleaner before then the chances are you’ll have a few questions or would like to know more about the process. We have a dedicated frequently asked questions page on our website and we’ve written this blog post to help answer some of the most commonly asked questions about hiring a domestic cleaner. If your cleaner is sick please call Maid2Clean and we will arrange suitable cover for you. If your cleaner is on holiday we will also arrange an alternative for you. Maid2Clean use several vetting techniques including telephone interviews followed by more in depth interviews in their own home. We also require proof of ID, address and references before we decide to accept them. Can I meet the cleaner before going ahead? When a cleaner is allocated to you they will call you to arrange an interview at a time to suit you. This allows you to ask your own questions and arrange your preferred regular cleaning times with the cleaner. Do I supply cleaning materials or does the cleaner bring them? Our cleaners do not carry their own cleaning materials and will need to use your own materials. We find most clients prefer this method as it give them more control over what cleaning materials are used in their homes and it helps keep the overall costs down further. What happens if I am not happy with my cleaner? If you wish to change cleaner just give us a call and we will assist further. 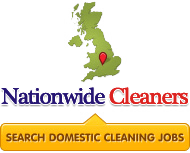 Our domestic cleaners are reliable and are selected from our extensive database of cleaners across the country. In most instances they provide a regular cleaning service but if you require a one-off spring clean Maid2Clean can arrange this for you. Maid2Clean domestic cleaners are professional so you can expect a very high level of quality. A lot of our cleaners have been with us for many years, some for over a decade! We aim to provide you with the same cleaner every single week to help you get to know them and for them to get to know you and the way you like your house to be cleaned. If the cleaner is ill or on holiday we will endeavour to arrange a suitable replacement for you. You get the chance to meet and interview your cleaner in your own home beforehand so you can judge the applicants standard of cleaning for yourself. You are in full control at all times. A regular domestic cleaner from Maid2Clean can be very good value for money. But it’s not just value for money they will provide, we give you back some free time which is the most valuable thing of all. What terrible weather the UK has been experiencing over the last few weeks. We hope you’re all safe and haven’t seen too much damage done to your property. Spring officially starts later in March and with the sun shining again this morning we all hope the weather is starting to change for the better. Fingers crossed! At Maid2Clean we don’t just provide regular cleaning services, we also provide a special one-off clean or ‘spring clean’ service. This is a more intense clean and is ideal for getting your house in tip-top condition from top to bottom. Our cleaners can discuss the specific domestic cleaning duties you require so you can be sure your house will be cleaned to your own specification. Maid2Clean have lots of benefits and exclusive services to ensure our domestic cleaning standards are extremely high. We take a great deal of pride in maintaining these standards and are always delighted to get feedback complimenting us on our service. You can read some of our customers kind words and testimonials on our TrustPilot page. It is our aim to keep these high standards of domestic cleaning throughout your time with us and we always appreciate your feedback. Our cleaning service is particularly popular because we strive to ensure you get the same cleaner every single time. If your cleaner is ill or on holiday we’ll arrange a replacement for you. In addition to this we allow our customers to interview their cleaner before going ahead to ensure they are compatible and happy to proceed. It’s little touches like this that help us stand out from the crowd and we look forward to maintaining these exceptionally high standards for the future. We post about our latest news and offers as well as handy cleaning tips and articles to help you keep your home spotless! So, if you’re on any of the above social networks please feel free to follow us to keep up to date with MaidClean and our domestic cleaning services. Maid2Clean offer several unique home cleaning services to make your life easier. We have a large database of professional home cleaners which means we can match you up with the perfect cleaner for you. You can of course interview your chosen home cleaner and when you are happy they can become your regular house cleaner. In addition to this we always try and make sure you get the same cleaner every single week. If your cleaner is ill or on holiday Maid2Clean will find a replacement professional cleaner for you. Our aim is for you to develop a long-term professional working relationship with your domestic cleaner. To ensure we work with the very highest quality domestic cleaners we interview potential candidates in their own home. This lets us review their standard of cleaning. All of these methods combine to ensure that you get the very best professional cleaners and that our cleaners are well looked after. Did you know some of our domestic cleaners have been with Maid2Clean for over a decade! So, are you ready to get some of your free time back? Are you ready to relax and let someone else take care of your cleaning chores? If so please click here and search for your town or post code to find your local Maid2Clean office today. As 2014 begins it is a time when many people are looking for a fresh start and making resolutions. Why not make your resolution for 2014 to free up more of your time so you can spend it doing the things you want to do with the people you want to spend time with? With Maid2Clean we can help take care of those chores around the house that you don’t want to do. Our professional cleaners can take care of things like cleaning floors and carpets, furniture, kitchen units and worktops, bathrooms, internal windows, dusting and vacuuming so you don’t have to. A regular cleaner from Maid2Clean will save you time and hassle leaving you more time to spend on things you really want to do. Take a look around our website if you’d like to learn more about our cleaning services or search for your nearest Maid2Clean office on our home page. Maid2Clean would like to wish you all the very best for 2014!